Every project has changes. This is no one’s fault and is not a sign of a disorganized project. Changes can happen for a number of reasons. Something on the project site that was not known at the time the drawings were prepared (see High on the Point October 5, for an example of this). Budget restraints. Sometimes this happens half way through because of financial restrictions brought on by outside forces. A good example would be thinking the existing well or septic is fine and then finding out they are not. The money has to come from somewhere and sometimes this means cutting something out of the finishing for the house. A new idea, change of heart or thought that had not previously been worked through. This is usually driven by the client and may come from a discussion with a friend or even a late night Eureka moment. We expect some of these to occur during the course of every project. 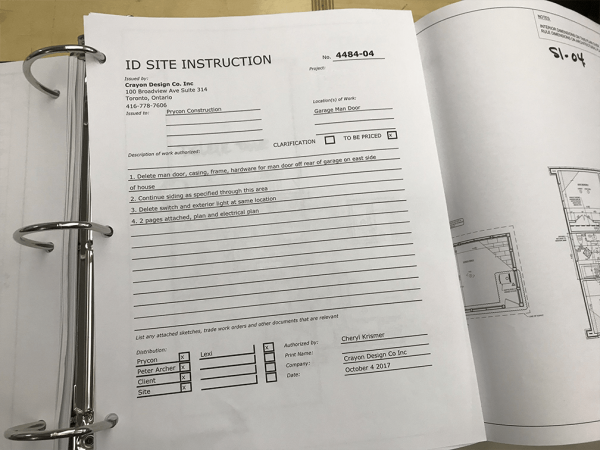 Our communication binder, with hard copies of all Site Instructions so we can refer to them. Each Site Instruction indicates if it requires costing or clarification. Sometimes Site Instructions will create credits if an item is deleted. Attachment to the Site Instruction clearly indicating the change requested. It also shows who receives the Site Instruction, so that if anyone has a question or an issue with it, they can respond. Sometimes we might even revise a Site Instruction if more information is required and reissue it. Keeping good documentation is critical for any project. One of my pet peeves is trying to go back and remember if we asked for a change, or approved an extra three or six or even nine months later. Everyone remembers things differently, so if it is written out, we can refer to the paper work and it prevents errors. Lake side elevation of house revised by the architect to address questions from the contractor, issued as SI-5. 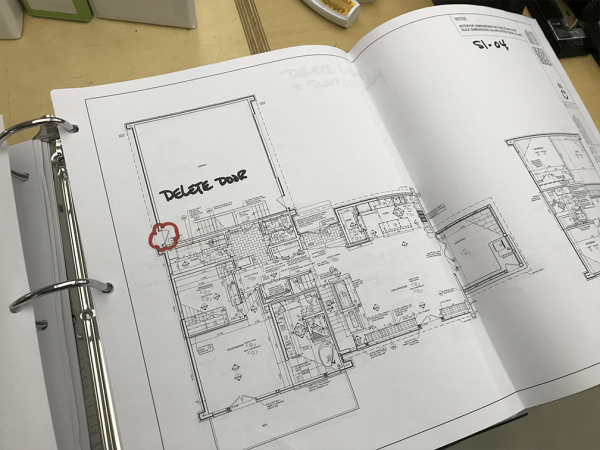 We also use Site Instructions to clarify documents on a project. We are all human and sometimes we interpret information differently. 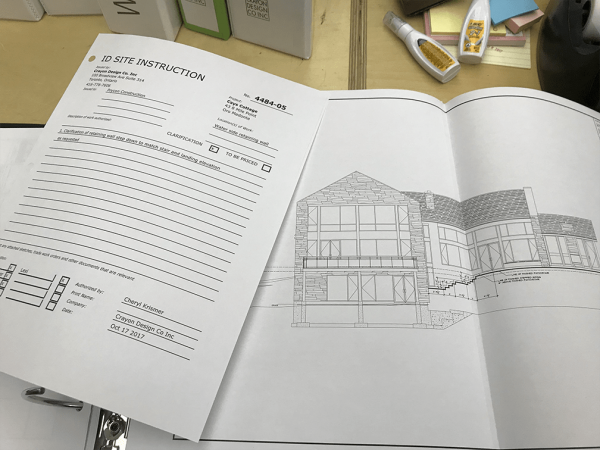 This creates confusion in a set of drawings so the Site Instruction can add more detail to the information previously issued to clarify a drawing. Site Instructions are a valuable tool and necessary for every project so having a good format to keep them organized is critical.